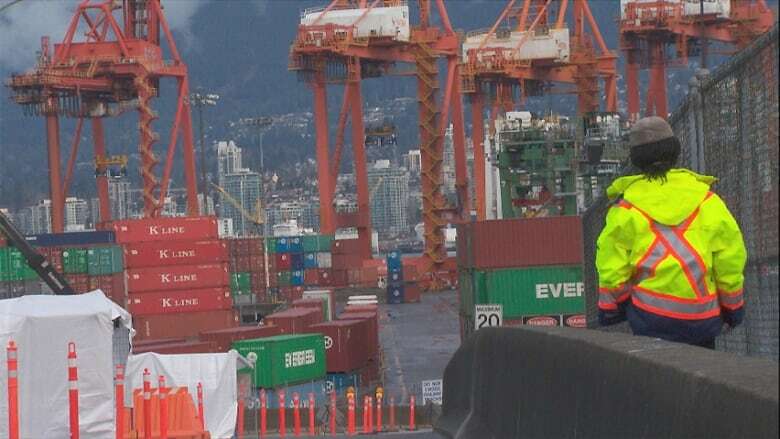 Container shipping at Port Metro's four terminals had been cut by about 90 per cent after 250 unionized truckers went on strike March 10, joining 1,000 non-unionized truckers who walked off the job in February. The dispute left hundreds of millions of dollars worth of cargo stranded at Vancouver-area container terminals and both Clark and Prime Minister Stephen Harper warned the dispute was jeopardizing the economy. The dispute between the truckers and the port largely focused on issues related to pay, including rates, unpaid time spent at the port waiting for cargo, and allegations of undercutting within the industry. The province introduced back-to-work legislation earlier this week that would have affected the unionized workers, but the government is now scrapping it. As part of the agreement reached Wednesday, the port will rescind any licence suspension introduced during the strike. The federal government will also implement a 12 per-cent hike in round-trip rates and a $25.13 minimum rate for hourly drivers. Port Metro Vancouver also committed to consulting with the trucking industry on an overhaul of the current port licensing system in order "to create a more stable trucking industry." The full text of the agreement is included below. The United Truckers' Association of B.C., which represents more than 1,000 non-union truckers at Vancouver-area container terminals, and Unifor, which represents about 250 union workers, were set to hold a news conference Wednesday morning at the provincial legislature in Victoria, but it was repeatedly delayed. 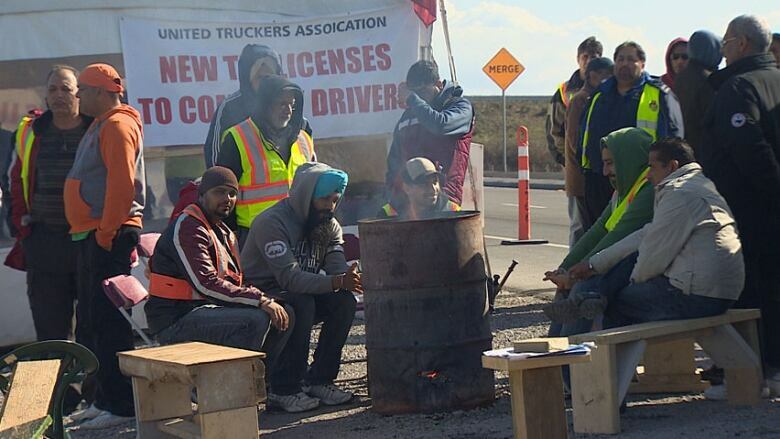 In between meetings at the legislature, Iqbal Grewal of the truckers' association said there has been progress this week. "They discussed some points which we agree on," said Grewal. "That's what we brought here." Asked if a settlement was close, Grewal replied: "Yes." Later, Unifor president Jerry Dias emerged from a room after a meeting between the union, the truckers' association, B.C. Labour Minister Shirley Bond and Transportation Minister Todd Stone. The province tabled back-to-work legislation earlier this week that would have affected the unionized workers, while the port warned all striking workers wouldn't have their licences renewed. The dispute has largely focused on issues related to pay, including rates, unpaid time spent at the port waiting for cargo, and allegations of undercutting within the industry. B.C., Ottawa and the port put forward a 14-point plan two weeks ago in an attempt to allay the truckers' concerns, but they quickly dismissed the proposal as inadequate. The latest negotiations focused on refining the government-backed proposal. The union has said it wants a higher wage increase, and it also wants fees for wait times to kick in after only one hour, instead of two, and increase over time. Port Metro Vancouver issued a statement Wednesday afternoon hailing the 14-point plan as the best way to end the dispute. "There are financial wins in the plan for truckers," port CEO Robin Silvester said in the statement. "There is also assurance that increased rates will be paid through better auditing of trucking companies. It is in all of our best interests that truckers come out of this dispute with their issues resolved because disruptions like this hurt each of us and Canada's international trade reputation deeply." The statement also said the port was concerned about "alarming reports of physical violence, threats and vandalism involving local truckers." The union and truckers' association have previously denied any wrongdoing in response to such accusations. The truckers don't directly work for the port. They are typically independent contractors, sub-contractors or direct employees of shipping companies. Trucks account for about half of the traffic in and out of the port, with the other half moving by rail. Earlier in the strike, the port said truck traffic was at about 10 per cent of normal levels, though it increased to about 40 per cent last week. The governments of Canada and British Columbia and Port Metro Vancouver have reached agreement with members of the United Truckers Association and Unifor to end the 28-day work disruption at Port Metro Vancouver and resume full operations as of Thursday March 27, 2014. The agreement was reached following extensive discussions between all parties, and the joint adoption of a refined joint action plan to address truckers concerns. Federal mediator Vince Ready has been retained to meet with all parties including UTA and Unifor leaders, immediately upon the resumption of full operations to review, finalize, and act upon the plan within 90 days. 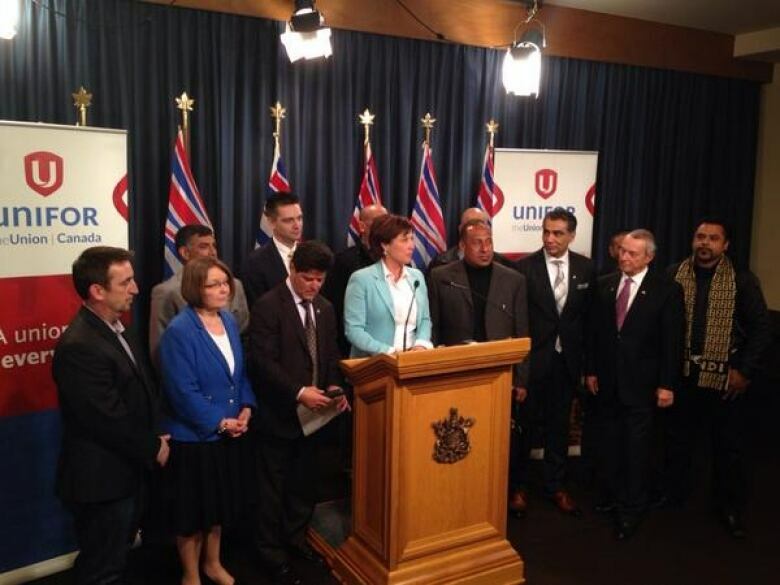 With the agreement, the Government of British Columbia is not proceeding with pending legislation that would have ordered a cooling off period in the Unifor job action. In recognition of the concerns voiced by container truck owner/operators, the work stoppage that has gone on for four weeks and the resulting severe impacts on the national economy, the Government of Canada, the Province of British Columbia and Port Metro Vancouver have collectively agreed to an action plan and expect an immediate and full return to work. Those who choose to continue this work stoppage will jeopardize their opportunity to provide drayage services at Port Metro Vancouver in the future. 1. Immediately upon resumption of normal trucking operations, Port Metro Vancouver will rescind licence suspensions where no criminal charges have been laid against any driver or operator by the police. Port Metro Vancouver will also dismiss without any legal costs its legal action in the Federal Court against the United Truckers Association ("UTA") (Action #S-141964) at the expiry of the interlocutory injunction issued in that action on March 11, 2014. Port Metro Vancouver further agrees not to commence any further action against Unifor or UTA or its members arising out of any activities of Unifor or UTA or its members that precede the resumption of normal trucking operations. 2. The Government of Canada commits to take appropriate measures to increase trip rates by 12% over the 2006 Ready Rates. The rates will take effect within 30 days of the return to work and will apply to all moves of containers (whether full or empty). To make drivers whole for the interim period between 7 days following the return to work and the date the new rates take effect, a temporary rate increment will be put in place. These rates shall be calculated on a round trip basis, and shall apply to all moves. A mechanism will also be established to attach a benchmark minimum rate for all hourly drivers to the federal regulation. The rate is anticipated to be initially instituted at $25.13 on hire and $26.28 after one year of service. Recognizing that per-trip rates for hourly drivers are a concern of all parties, the issue of the prohibition of such rates shall be reviewed in accordance with paragraph #14. Canada and B.C. further commit to put in place a new mechanism to ensure off dock trips (including within a property or between properties) are remunerated consistent with the revised regulated rates, and the Government of Canada will expedite its 2014 Regulatory Framework Review which will assess the current wage and fuel surcharge rates. 3. The Province of British Columbia commits to engage unions and their certified employer companies on the importance of achieving renewal collective agreements and will ensure access to mediation if both parties agree to its use. 4. As per the current federal regulation, upon return to work the fuel surcharge multiplier will be amended from 1% to 2% which will result in a 14% fuel surcharge immediately upon a return to work. This fuel surcharge must be paid to owner operator drivers without exception and this will be enforced through increased and regular provincial audits. 5. The Province of British Columbia will strengthen the scope of the audit function so that all trucking companies registered in the trucking licensing system for local drayage will be subject to regular audits conducted in a transparent manner and penalties for rate violators shall be severe and shall include cancellation of licenses for companies and individual drivers. The scope of the audit program will be expanded to include union and non-union drivers and "off dock" movements. The province and Port Metro Vancouver will work with the industry to define the parameters of the audit program, with full implementation by June 15, 2014. 6. Whistleblower Mechanism: Port Metro Vancouver and the province will work together to provide a mechanism for the reporting of concerns related to compliance with trucking licensing system requirements (including compensation provisions) or incidents of intimidation or harassment related to container drayage activity. The new mechanism will allow for direct input to the provincially delivered audit program and will be in place no later than June 15, 2014.
iv. Control over the total number of licensed trucks to avoid a surplus and support the goals of this action plan. v. Compensation will be tied to terminal performance during extended hours. 10. The Government of Canada and Port Metro Vancouver will expedite the roll out of the next phase of the GPS project to outfit the balance of the trucking fleet with GPS technology. To be completed between May and September 2014. 11. Port Metro Vancouver in consultation with terminals and trucking stakeholders, will implement an enhanced common reservation system by January 2015 to address concerns related to the current reservation system. 12. Port Metro Vancouver will establish a mechanism for directing the Terminal Gate Efficiency Fee (i.e. Waiting Time Fee) to be paid to the trucking companies who will be required to pass the fee on to independent owner operators. Starting seven (7) days after a return to work, the Terminal Gate Efficiency Fee (i.e. Waiting Time Fee) shall be paid at $50 per trip for time spent waiting at Port terminals (Deltaport, Fraser Surrey Docks, Vanterm, Centerm) after ninety minutes of waiting time. At two hours of waiting time, an additional $25 fee will be paid per trip. At two and half hours of waiting time, an additional $25 fee will be paid per trip. Each additional half hour will be paid at a rate of $20. This waiting time shall begin to accrue from the designated points outlined below. i. Vanterm / Centerm - Waiting time shall be measured from the time of entrance to the time of exit from the Clark, McGill and the vehicle access control gate at Heatley entrances. ii. Deltaport - A mechanism will be developed to identify time of entrance and exit to and from the terminal, and this will be measured at the last (current) overpass on the approach to Deltaport Way. iii. Fraser Surrey Docks - Waiting time shall be calculated from the time of entrance to the time of exit from the entrance off of Elevator Road and Highway 17.
a. CN Intermodal (Port Kells) - Waiting time shall be calculated from the time of entrance to the time of exit from the entrance off of 96 avenue and Highway 17.
b. CP Intermodal (Pitt Meadows) - Waiting time shall be calculated from the time of entrance to the time of exit from the entrance to CP's yard. 13. A steering committee will be formed immediately following the return to work and will consist of representatives from the unionized and non-unionized trucking community, the terminals, Port Metro Vancouver, Transport Canada and the Province of British Columbia to be chaired by Transport Canada. The steering committee will monitor implementation of all commitments in the Joint Action Plan and share the results on a regular basis with all stakeholders. 14. The Province of British Columbia, the Federal Government, and Port Metro Vancouver agree that Vince Ready shall be seized to issue recommendations on all points in this action plan that will be reviewed, finalized and acted upon within ninety (90) days of a return to work. 15. Unifor and the UTA agree to an immediate return to work based upon the above and acceptance by Canada and British Columbia.